We are living in a golden age of facial hair, when men of every stripe choose to throw caution and their safety razors to the wind and let their beards grow as nature intended. Sartorial choices aside, this follicular freedom is not without its challenges, namely keeping all those wiry hairs in check. As anyone who has tried will agree, this is no mean feat—one errant snip or shave and you're either trimming back to a 'stache or starting from scratch. But, as with seemingly every category of self-maintenance today, there is a technological solution with today's breed of high-performance, and surprisingly affordable, purpose-built, beard trimmers. Unlike yesteryear's selection of corded, multi-purposed trimmers that were meant for haircuts and were either prohibitively pricey or essentially disposable, today's trimmers are user-friendly, easier to maintain, completely portable and in many cases are built to handle any hair needs you may have south of your eyebrows. 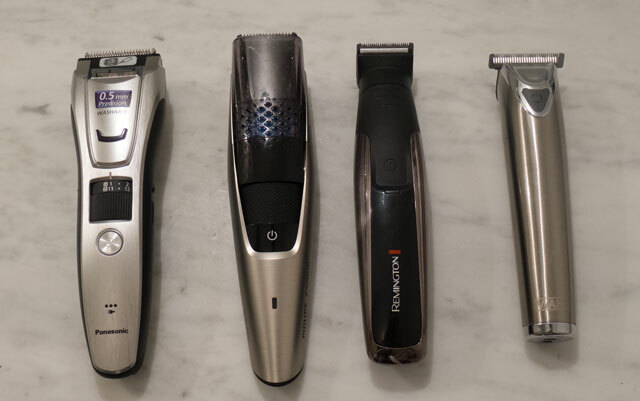 With dozens of beard trimmer options available on the market, we narrowed our testing list to models that met a handful of key qualifications. For starters, the blades needed to be high-quality stainless steel, both to maintain an edge and also to thwart rusting (and, ideally, require infrequent maintenance). For power, we looked for models that could function while plugged in or via battery, or at a minimum, had a fast-charge system to allow for last-minute shaves when the battery is on empty—a common pitfall of earlier generation trimmers. In order to accommodate a wide range of possible hair lengths, we limited our search to models with a minimum of eight length settings or swappable combs. And models we considered needed to be comfortable to hold and use, easy to clean and ideally be water-resistant. In order to narrow down the choices, we also looked at existing tests from professional sources and user reviews, such as Amazon ratings, to see how the trimmers hold up across a range of real-world conditions. Style and Detail Kit and the Wahl Lithium Ion+ . Our search resulted in four standout models that met our criteria and had received a critical amount of praise: The Panasonic ER-GB80 ($88); the Philips Norelco BT7215 ($60); the Remington PG6171 The Crafter Style and Detail Kit (technically called the Crafter Beard Boss Style, $37); and the Wahl Lithium Ion+ ($60). After months putting our trimmer choices to work on my unkempt mug (and another couple rounds with a particularly hirsute friend), I found the Panasonic ER-GB80 to be the best overall beard trimmer. I liked that it can cut 39 possible hair lengths in .5mm increments, and that adjusting the length is simple, thanks to a built-in thumb dial that's easy to read and doesn't slip. Charge time for a full battery is about an hour, but it can work when plugged in, too. Cleanup is relatively easy and I appreciate that it's water-resistant enough to hold under running water—a big help with cleaning. And most importantly, the GB80 is capable of shaving a beard to an even length without hair-pulling or much hassle. 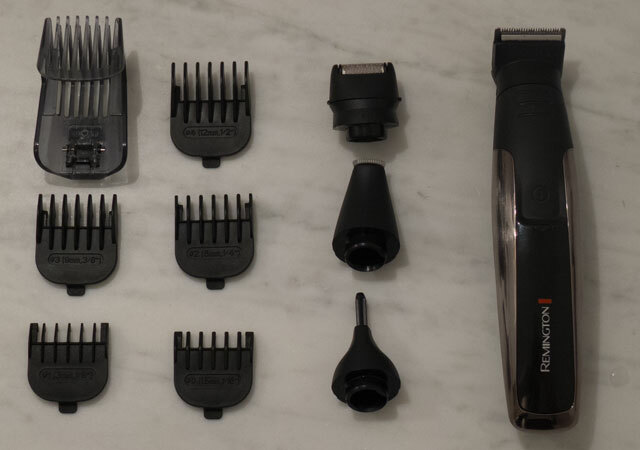 While there was much to like about the other models—and a couple of them might make good options for certain users—we think the Panasonic GB80 is the best beard trimmer for everyday use. The baseline judgment of a trimmer has to be its ability to cut hair cleanly, and quickly, with as few strokes as possible and ideally no pinching and pulling hairs in the process (or nicks either). Other factors noted above, such as convenience, charging times, accessories, and so on, are all important but not the major concern. To test the beard trimmers, we allowed our facial hair to grow out to about a quarter or half inch and then shaved swaths on our faces. The goal was to find a razor that could cut the hair evenly without taking more than a swipe or two so that we ended up with an even stubble 2 mms long. After that, we ended up trying out all of the trimmers for full-face trims on two faces at least twice, and at a couple different lengths ranging from zero (essentially a shave) to 3.5 or 4mm. The ER-GB80 is the updated model to Panasonic's well-rated line of trimmers (including the 60 and 40 model) and feels sturdy, polished, and thoughtfully designed. In particular, the dial for adjusting the trimming length clicks into each setting position and is essentially slip-proof—an issue I've experienced with other trimmers in the past and which inevitably leads to a fiasco when the length setting slips mid-shave and you end up with a bald patch. On the dial there are two rows of numbers and a letter corresponding with one of the included comb heads (the A comb is for shorter beards up to one cm, the B for hair lengths up to 2 centimeters, and a third rounded comb is intended for “manscaping” that cuts hair to a uniform 1/16 of an inch, apparently the international standard for body hair.) A second, finer-grade razor, intended for sideburns, brows, and facial finesse work, is tucked just above the dial and emerges with a thumb push. The power button is a sturdy metallic-plastic, and below it is an array of LEDs showing that the battery is charging. The lithium-ion batteries last about 50 minutes on a full charge, which takes an hour from empty. That's plenty of time for those doing a basic trim—our test shaves lasted less than 5 minutes. (Note that Panasonic cautions that if the batteries go uncharged for extended periods of weeks or months it may be necessary to charge them for an 8-hour stretch to restore them.) In the event you are in a rush and discover the razor's batteries are flagging or already kaput, simply plug in the charging cord, give it a minute to resurrect the batteries a bit, and then you're able to shave as needed. That may seem like a minor detail but in fact anyone who has owned a trimmer, particularly old style ones with NiCad batteries, knows the frustration of being caught short-handed and long-haired with no option but to wait out a half-hour of charging or more—and full charge times could take 8 hours or even a full day. Also worth noting is that unlike some models, the GB80 can be charged in foreign countries with 220 voltage, a boon for travelers. In my test trims the Panasonic took just a few passes to through facial growth that was about 1/4 inch or so long, leaving few stray hairs and without pulling, at the #2 setting and #3 setting. Nicely, the Panasonic maintains a consistent speed without fluctuating (that wah wah sound you hear) as I’ve experienced with other trimmers, and which can result in poor cutting or pulling. Getting a close cut near our nostrils was trickier than with some of the small-bladed trimmers such as the Remington, but I realized the secondary detail trimmer does the job well enough. I used the detail trimmer for the cheek line and sideburn as well and it does a fine job. I especially like the included adjustable hair guide or comb (it comes with three: an A for short lengths, a B for longer, and a third for body hair) which glides smoothly on skin and worked better than individual clip-on combs, which can be fussy to attach and align correctly—with the Wahl trimmer we did a test trim and realized afterward the comb was on crooked. Overall the Panasonic was the trimmer that offered the best total package: it's easy to use, performed well, was easy to maintain, was easy to travel with and is reliable. 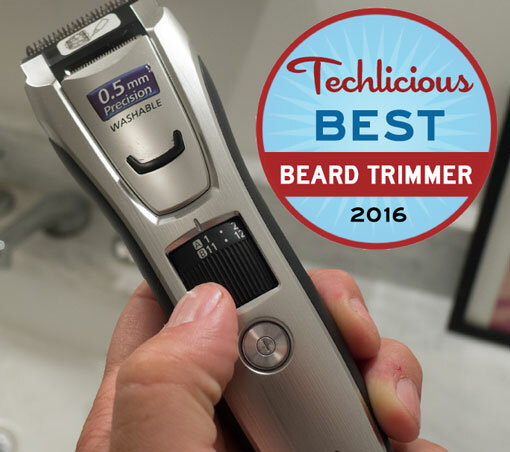 While MaleGroomings.com loved the Panasonic ER-GB80 in its 2016 guide to beard trimmers, it found it came in a close second place, while still noting the quality of the shave, and its overall design: "Panasonic does ergonomic better than everyone. The rubberized grip is outstanding." Their top pick, the Remington MB4040, is largely well-regarded except earns complaints for its flimsy combs and the inability to trim beards to stubble-length. And though Remington offers a substantial 2-year warranty, there were enough user complaints about devices crapping out in under a year for me to consider other models. 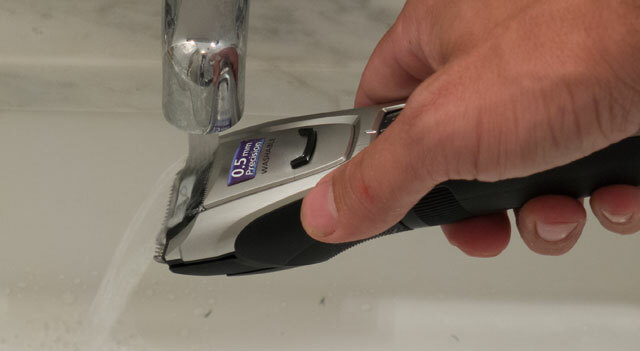 Grooming site ToolsOfMen.com is equally enamored with the GB80, giving it a rating of 9.1 out of 10, and praising its convenience, thoughtful design and versatility as a corded or cordless shaver that's water-washable. In terms of its trimming prowess, ToM enthuses: "The Panasonic ER-GB80-S simply feels like you are getting a barber quality shave without having to actually visit the barbershop." 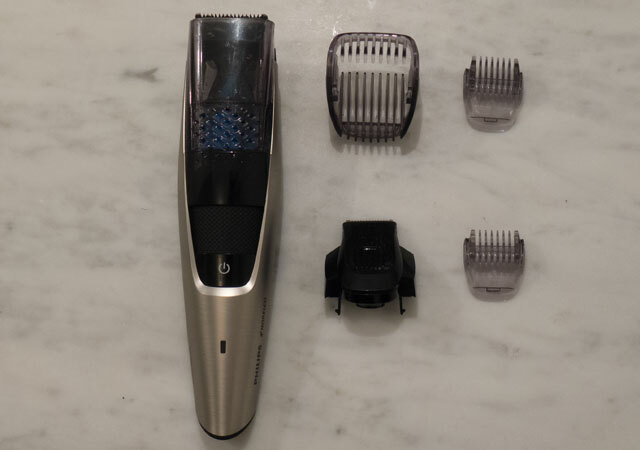 While I didn’t test their top pick, the Norelco 7300, I tried its newer brother, the 7200 which shares many of the same features and pitfalls, such as difficulty in keeping it clean and flimsy combs that are difficult to attach correctly. And the ER-GB80 is well-rated by Amazon users, earning 4.4 out of 5 stars with 152 customer reviews. Most users praise the build quality and design in particular. Remington went all-in with the beard trend, and this model, part of its Beard Boss line of trimmers comes in a kit festooned with old timey fonts and photos of gentlemen—the official Beard Boss team—with admirably complicated facial hair getups. 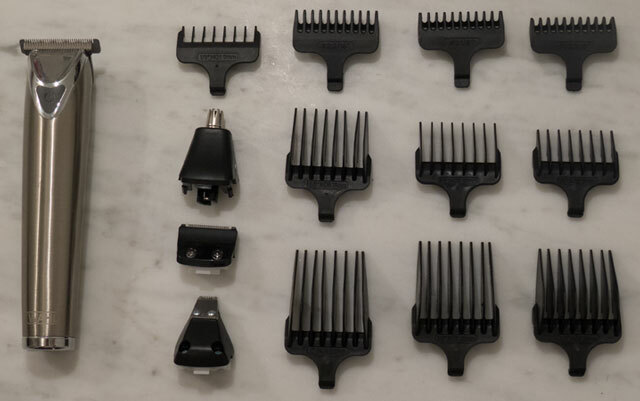 The 11-piece kit includes an array of long-length combs, an adjustable height comb with 10 settings, and three replacement razor heads for exquisitely precise facial hair sculpting, as well as nose, ear, and eyebrow trimming. The Remington was a close second for us, and edged out the Panasonic in terms of cutting the most hair per swipe, which we attribute both to the smaller, finer razor size and a "turbo" mode which jacks the razor speed to 11—because it's half the width of the Panasonic's blade, though, it required far more swipes to fully shave It also has a 5-minute quick charge and a sprawling 180 minute run time, both of which are nice features. 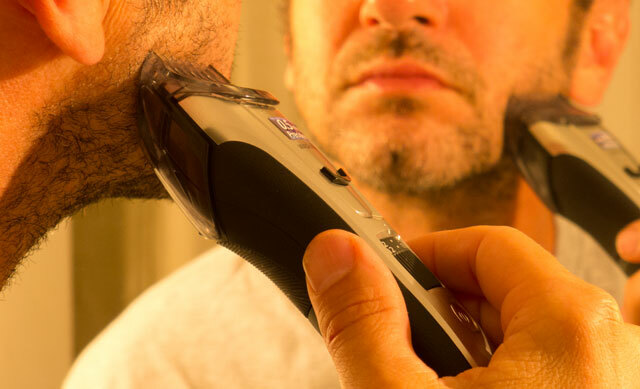 While it was the priciest model we tested, at $87, the Panasonic ER-GB80 was worth the price for a quality, long-lasting beard trimmer that is easy and convenient to use and maintain. 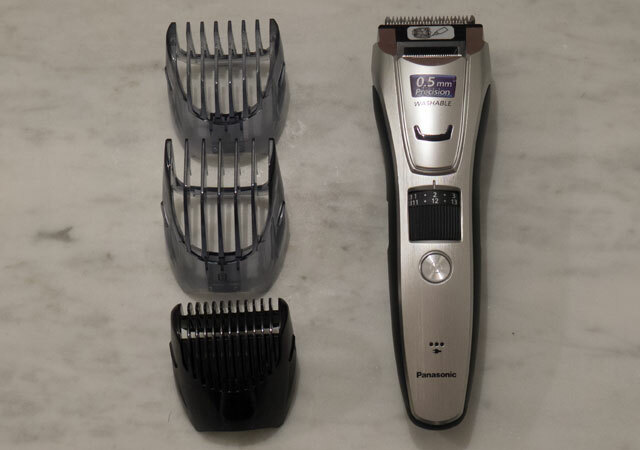 And though all four of the trimmers are worth consideration depending on your needs or preferences, the Panasonic was the best overall model: it made trimming a typical beard easy and consistent, it is easy to keep clean, and convenient to use at home or on the road. Remington HKVAC-2000. Unfortunately in Remington’s infinite wisdom they stopped making them. Originally in the $40 range, for years they’d sell for $200-300 on Ebay. Remington did replace that model in the past year, but the ratings aren’t great. I’ve been using mine for over 10 years on a weekly basis…I wonder what Marketing person lost their job for suggesting they discontinue the HKVAC-2000. From my personal experience, I have found that Panasonic have one of the best trimming technologies. They have many type top rated trimmers in addition to the beard trimmer featured here. My Panasonic models have lasted many years mainly due to good battery life and smooth motor. The Beard Trimmer is looking is very good. but what i find this Beard Trimmer?